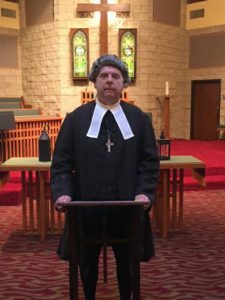 I am Reverend Mather Byles, Jr. Like my father had done before me, I graduated from Harvard College, my graduation was in 1751. After a falling out with my first church in New London, Connecticut, I moved back to Boston and in 1768 assumed leadership of Christ Church, an Episcopal parish. You know this church as the Old North Church. My message today starts the third week of April in 1775 when I had my second falling out with a church. Raised in a Tory household, I was a staunch Loyalist. After preaching a fiery sermon against the Patriot cause, I was fired by John Pulling, one of our vestrymen (I believe you would call him an elder). This time, however, I had to flee Boston with my family to Halifax, Nova Scotia. Now I have been waiting 242 years to set the record straight. The Christ Church was the oldest standing church in Boston. In 1775, on the eve of America’s Great Revolution, most of the congregation were, like me, loyal to the British Crown and many of our church members held official positions in the royal government, including the Royal Governor of Massachusetts. King George III, himself, had given us the silver that we used at our services as well as our Bible. There was, however, this deep division. Some members were loyal to something known as the “patriot cause.” Soon, the steeple of my church would serve a military purpose. Chosen because it was the tallest building in Boston, easily visible from many directions standing, high at 191 feet and the other reason would come from within our congregation. God would begin to choose His people to step forward in the creation of a new country. I must say that I was deeply upset over this second firing. Our King was good, he had provided protection and resources to these colonies. But there was something that I did not understand at the time, it was the desire to be free, planted into the hearts of men by God Himself. My entire worldly life from that moment would be filled with a hatred for John Pulling. But God gives us history for a very good reason. History reveals God’s Truth and God’s plans for His world. One of our congregational members was Paul Revere, a talented silversmith, engraver but more importantly an active member of Boston’s Sons of Liberty. I did not know that for months, he had served as the group’s messenger, carrying information as far away as Philadelphia. When the leader of the Sons of Liberty, Dr. Joseph Warren, learned that General Gage’s army would march on Lexington and Concord, he called once again on Revere (and another young man, William Dawes) asking them to ride into the countryside to warn area militia members. Dawes was to take the land route out of Boston through the Boston Neck. Revere would cut across the bay in a small boat and then ride to Lexington. The only surviving lantern now in the Concord Museum. With Boston under curfew, our British soldiers were on guard to arrest anyone caught wandering the streets after dark. If both Revere and Dawes were detained, their warning would not reach Lexington. A back-up plan was needed; Revere recalled the view of Charlestown from atop the Old North Church where he rang the bells as a teenager. Revere would choose to engage an intimate friend, business associate and a congregational member, John Pulling to help. John was the perfect choice. Both Paul and John were members of Boston’s Committee of Correspondence, whose principle role was to gather intelligence and track the movements of British troops within the Colonies John Pulling was a passionate patriot but he also believed that it was God who wanted the colonies to be free from British rule. 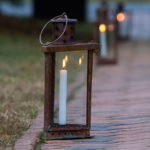 If caught hanging the lanterns, John hoped he could provide a believable reason for being in the church, he was part of the “leadership team” and needed to be there after the loss of their Rector, me. 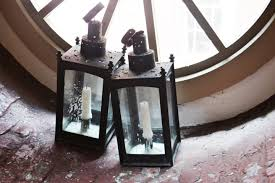 So, on April 18th, John Pulling was ready to go to the church and hang two lanterns from the steeple window on the north side facing Charlestown. This would be the signal that the British Regulars were coming by sea. Robert Newman, our sexton (janitor) also had clear patriot allegiances but, perhaps more importantly, he had the keys to the building. He also lived just across the street from the church. I always considered Robert to be a trustworthy young man, but he had not, yet, been very active in the rebellion. He had struggled to find work and had taken a job he did not like as our church caretaker. History shows us that Robert was eager to help John Pulling. Dawes left by horseback taking the land route while Revere went to his boat in Boston Harbor and was rowed across by two friends. The men used a petticoat to muffle the noise made by the oars. Soon, 700 British soldiers embarked on their journey to Lexington. 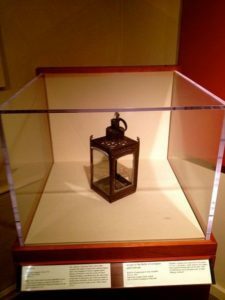 While Revere and Dawes planned to deliver their messages to Lexington personally, using the lantern method, they would have a fast way to inform the backup riders in Charlestown about the movements of the British; these back-up riders, about 40 of them, could also deliver the warning message. It was about 10:00 PM when Robert Newman opened the church door with his key and John Pulling joined him inside. A third patriot, Thomas Bernard, stood guarding the door. John Pulling lit the lanterns and proceeded with the task of climbing to the top of the steeple and hanging the two lanterns that would signal the British troops were now disembarking by sea. The lanterns were hung for less than a minute but this was long enough for the message to be received in Charlestown. The militia waiting across the river were prepared to act as soon as they saw them. As I have had several hundred years to think about this now, it was this kind of unselfish act, this risk, this attitude to be involved that Christ was talking about in His sermon on the mount in Matthew 5:14-16. If there ever was an example to follow, it is this one. Too many people, myself included, just wanted to leave well enough alone, or were not interested in lifting their light, taking those risks that Christ talked about. Too many in the world today don’t want to get involved. But I need to ask you these questions: Can freedom exist without involvement, without risk? Can patriotism exist without a reliance on God? The lanterns were immediately seen by the British troops. Newman escaped from a church window but was quickly found and placed under arrest. Here is where the controversy remains. Even today, the Old North Church credits Robert Newman for lighting and raising the lanterns. Truth my friends is sometimes elusive. Could it have been as simple as Newman telling the British soldiers that the other guy, did it? Was it Newman who gave John Pulling’s name to the British officials? Newman was released and a search for Pulling began immediately. It would be these facts that the Historical Society used later to determine that Robert Newman was probably not the one who raised the lanterns high in the steeple or else, the British would not have released Newman and pursued John Pulling instead. History tells us that the next day at the battle of Lexington and Concord, 73 British regulars died, 174 were wounded and 26 were missing in action. The patriots were ready and the British would have considered the one who raised those lanterns a traitor and hung him. John went back to his home and hid in an empty wine cask in the cellar. Then, later, disguised as a fisherman, he eluded the troops and embarked in a small skiff leaving Boston by sea. His skiff was challenged by a nearby British warship at anchor, but through God’s providence, allowed to pass. You see, even the mightiest navy in the world was no match for God. Sarah Pulling, John’s wife, should also be called a patriot. Her husband, John was now a hunted man and she too had to flee Boston that night. John and Sarah chose to rendezvous at an old cooper’s shop on the Cohasset shore. Because the British were looking for John, his journey would take much longer than Sarah’s. Sarah, then pregnant, would arrive first and give birth to a daughter before John’s arrival. In their haste to leave Boston, John and Sarah would abandon all their possessions and would be forced to live without resources in what would have to be called primitive accommodations at best. While the Pullings remained safe from the British, they would be in exile until the last British troops evacuated Boston about one year later. Despite all its historical significance, the “One if by Land Two if by Sea” signal was just a backup plan. It was meant to warn patriots in Charlestown, a borough across the river from Boston, in case Revere and Dawes themselves did not make it on time. So, were John and Sarah’s risks of any value? Well, history tells us that Revere was detained by the British and did not reach Lexington until the battle had already begun. William Dawes did not make it either. He fell off his horse and his horse ran away. After procuring another horse, Dawes showed up late too. The warning message reached Lexington in time because of the many riders who could see the lanterns hung in the steeple that night. God’s providence, those lights high on in the church steeple, would start 13 colonies on a path that would create the greatest nation on the earth and the freedoms enjoyed today. My feelings of revenge would be well fed. When John and Sara finally returned to Boston a year later, everything, their possessions and their home were gone. John had become ill during their exile and died shortly after their return. For Sarah, this already was a second marriage. Now she would be a widow again. For me, I finally had my satisfaction or so I thought! But there is more to their story. Sarah had grabbed only a few possessions, only a few things she could carry as she left that cold April night. What would you choose to take if suddenly, your very wellbeing was at risk and you had to give up everything you owned, everything, and run, run for your life? Sarah’s choice was to take her Bible and that very Bible remains in the possession of her descendants today. It was that Bible and the stories shared between Pulling’s family members that the Massachusetts Historical Society had so carefully noted many years later. John and Sarah’s light had lived from generation to generation through her Bible and the sharing of their story. How does history remember this event? Well, from a worldly perspective, the statues, and poems, all well-deserved, went to Paul Revere. The plaque on the side of Old North Church and most of the history books honor Robert Newman without any mention of John Pulling and no one mentions Sarah. As I went off to history, I learned a most important lesson, our God honors those who are the true examples of Christ’s light. John and Sara pulling, Paul Revere, even Robert Newman understood that they should not hide their “light” under a bowl. They thought about their country and they believed in their God. They knew the truth, they were never too busy. They didn’t leave well enough alone. They were not only interested in freedom, they were willing to risk their lives for it. Each raised the Light of Truth so that those around them could see. Yet, while I lived during divisive times, so do you. Today, there are many lights being held high so how is it that you are going to know which light to follow? Across this great nation, your religious freedom is under assault in ways that our founding fathers never could have imagined. Religious liberty is called the “First Freedom” for good reason. Without it, every other freedom would crumble. While I, Rev. Mather Byles, was positive that I was right, the Loyalists were right, the King was right, history proved us oh so wrong. You, LORD, keep my lamp burning; my God turns my darkness into light. With your help, I can advance against a troop; with my God, I can scale a wall. When truth is behind any movement, God will be behind it too. To fully understand how a fledgling group of colonies could defeat Britain, the most powerful nation on earth, you need only to go to a document signed one year later on July 4th, You all know it by the wrong name. It is not the Declaration of Independence but appropriately named “The Unanimous Declaration of the Thirteen United States of America.” Please value my advice to you this day. It was unity and the values and principles shared by the patriots that created your great country. You must always remember that the enemies of freedom always attack unity first. It is the uncivil discourse and divisiveness that all citizens should fear most. But rest easy my friends, God always wins in the end! O God, as light comes from these lanterns, May the blessing of Jesus Christ come to you. Warming your hearts and brightening your way. May Christ our Savior bring life into the darkness of this world and to all of you, as we wait for His coming. 1. 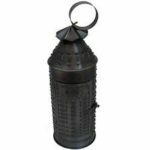 This lantern is called a barn lantern or also a Revere lantern. Most people raised their own animals and the animals would live in a barn. If you wanted to check on them at night, you would need to use one like this. 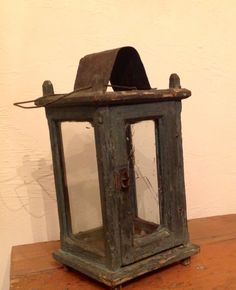 They used this lantern because if you dropped it in a barn, it would not break and start a fire. 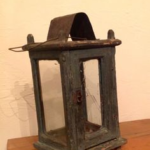 You could also hold this lantern and ride a horse. The wind would not put out the candle and other people could see you at night. 2. Here is a funny candle holder. 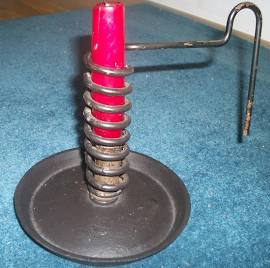 It is called a courting candle. When a boy wanted to visit with a girl he liked, her mother would turn the candle up and this would be like a clock. When the candle burned down to the top of the holder, the boy had to leave. If the mother liked the boy, she might give it an extra turn to give him more time to visit. But if the boy was not polite, mom would turn the candle down so he had to leave sooner. 3. If you were to take a long walk at night, you would use a lantern like this. It is just like a flashlight. There is a mirror in the back that reflects the candlelight in the direction you are walking in. The handle is different too. It is meant to be carried in your hand, not hung on a wall. 4. For your house or bedroom, you would use simple wooden lanterns. These would give you light to read or do your school work after the sun when down. Remember, there was no electricity, no TV, no refrigerator, no telephones. Life was very simple. 5. The last lantern is identical to one of the most famous lanterns in all history. 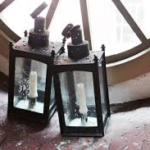 Over two hundred and forty years ago, two of these lanterns were placed high in a church steeple as a signal to help our country defend itself. The lanterns worked because the human eye can see a candle at night up to 10 miles away. That means if you put this lantern high in the air right here, you could see it in downtown Orlando. Jesus is just like this lantern, even though the candle is small, we can be seen His Light through the darkness wherever we are.